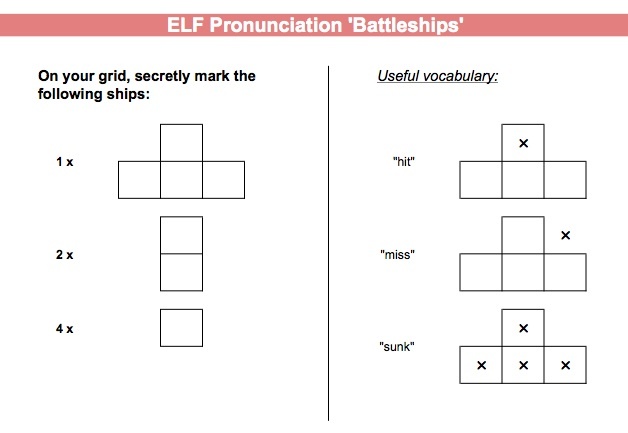 This is a variation on the traditional ‘Battleships‘ board game, but designed to practise pronunciation. I’ve used it with my own students many times and they always find it challenging and engaging. The game involves learners very carefully articulating words in minimal pairs so that their partner can understand precisely which word they’re saying. The idea is to include words in the game which contain sounds that are typically difficult for particular learners of English, depending on their first language background. Of course, practising minimal pairs over and over and over again has the potential to be mind-numbingly repetitive – but when done in a competitive game format, it’s much more fun! To better understand what makes up the ‘Lingua Franca Core’, check out this post. If you want a printable one-page version for your own reference, you can download one here. Make your own game boards – coming soon! 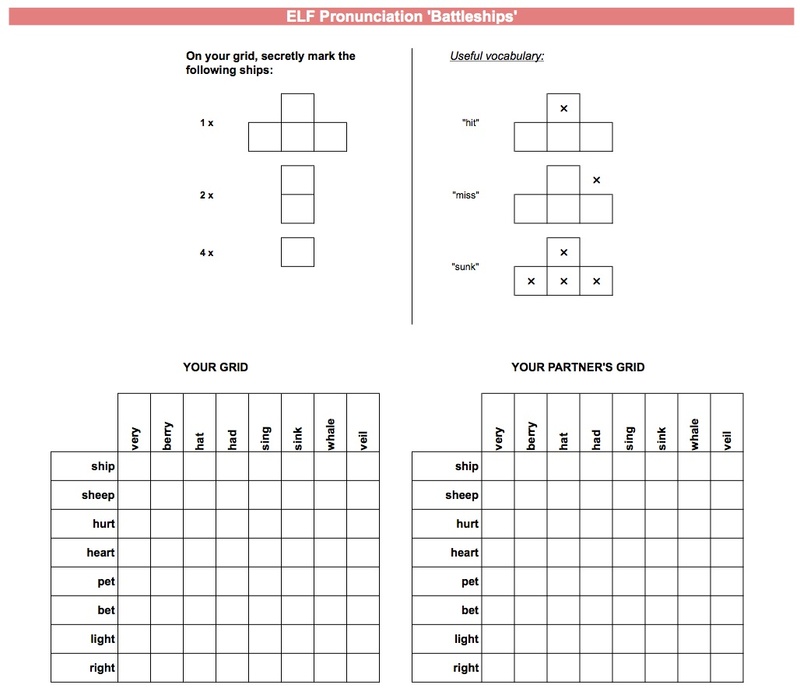 Of course, if you teach a group of students from various L1 backgrounds, you might like to create your own bespoke game grid that caters for their different L1s, so they can practise understanding and being understood in a true ELF environment. In this case, we will soon be making available for download the original file used to create the above game boards. It includes lists of appropriate words for 12 different first language backgrounds and a blank game grid so you can make your own bespoke game boards. There are instructions on how to do so in this video. For your own reference, the file also includes notes on the Lingua Franca core (i.e. the basis of the words selected for inclusion in the game), as well as a bibliography of all the linguistic sources which this data has been based on. Students work in pairs. In each pair, the students are enemies – not a team! The idea is that one student’s grid (marked “YOUR GRID”) represents the ‘sea’, and they must place some ‘ships’ in it to protect from their ‘enemy’ (the other student in the pair). They cannot see each other’s ‘seas’ – they must hide their grids from each other. They take turns to guess where each other’s ‘ships’ are. Whoever ‘sinks’ all of their enemy’s ships first is the winner. 1. Each student gets a copy of the whole game board (one A4 page). Now they’re ready to play. 1. Keeping their grids secret from each other, the students take turns to guess where each other’s ships are. 2. They can only do this by giving coordinates, one square at a time. For example (using the grid above), if I think my partner might have a ship in the third box from the left in the top row, I would say ‘hat, ship’. As you can see, I have sunk one of his small ships and am in the process of finding another. The main points of the game are (1) to practise articulating sounds very clearly so that listeners can differentiate between similar-sounding words, and (2) to practise articulating particularly challenging sounds. So if a student cannot tell what word his/her partner is saying, the partner must clarify by contrasting the two confusing words, and not by defining which word they mean or giving other clues which allow them to avoid the pronunciation challenge! 5. The game finishes when one student has sunk all of his/her partner’s ships. Then they can look at each other’s grids. By this time, the teacher should have had plenty of opportunity to hear which sounds were causing the most difficulty and might require more work in a future lesson. Agreed great game, and Chinese speaker version, worked well for Lao student I was tutoring. Hi Edwin, thanks so much for taking the time to leave this comment. It’s great to hear when people have used our resources with success! Great, glad to hear your students enjoyed the game! We do have plans to make the original file available at some point but so far have encountered some tech issues which I’d like to iron out before sharing. So watch this space!